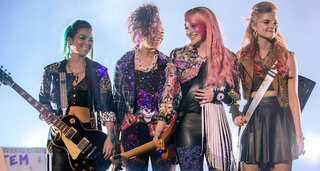 Here's the New Jem and the Holograms Trailer. I Think I Hate It. The cinematic reboot of Jem and the Holograms is happening and you can’t stop it. A new trailer has arrived starring Aubrey Peeples as Jem, Molly Ringwald as someone named Aunt Bailey, and I don’t see any holograms. Instead of drawing on the 1980’s cartoon we know and love, this movie looks like a less interesting version of Beyond The Lights—just me? Image via Jem and the Holograms website.